This page describes the data sources behind Gapminder’s global trend for legal slavery, v1. countries abolishing slavery, used in the first graph on page 60 in the book Factfulness. In this video Ola Rosling gives a quick overview of the data and criteria used. The last sheet contains the dates of abolishment used to generate the trend. If you want to help us improve this dataset please let us know in our Data Forum. Counting the number of countries where forced labour is legal, which means: there’s no law or constitution prohibiting forced labor or serfdom, and the country hasn’t yet signed any UN convention banning forced labor. And then, if state owned companies or the government itself is accused of practicing forced labor, while ILO can’t investigate it, then slavery here is considered legal, despite what it says on the legal documents. The fact that a law is passed is a great achievement toward condemning slavery, but it doesn’t mean the practice is interrupted. There’s a huge difference between theory and practice: between legal abolishment and slavery in practice. And with all laws, the difference is called law enforcement: read police intervention. This is true both historically and in the world today. Our counts of legal shifts in countries in different years, should not be interpreted as expressing the extent to which slavery is practiced. In many countries law enforcement is still not taking sufficient action to make sure the law is followed to end the remaining slavery, as the examples of North Korea, Turkmenistan and Tajikistan today, clearly show. We first collected dates of slavery abolishments in the form of passed laws, constitutions or signatures of UN conventions, for all 195 states recognised by the UN. The first date when some kind of legal document was passed was chosen from the following sources: The three UN declarations for banning forced labor were written in 1926, 1930 and 1957 available on UN treaties website. The dates when countries passed domestic laws and constitutions that explicitly ban slavery or forced labor, we took from the database called Slavery in Domestic Legislation, compiled by Jean Allain and Dr. Marie Lynch, at Queen’s University Belfast. Most historic dates of abolishment before 1950 come from the English Wikipedia article called Timeline of abolition of slavery and serfdom. Finally we made one exception. In 2018 all governments have a legal document banning forced labor, but some of them seem to be practicing forced labor themselves. An organisation called www.antislavery.org and others report about forced labor commanded by state the owned cotton industries in Turkmenistan & Uzbekistan most commonly during cotton harvest in October every year. And there are plenty of reports of forced labour in work camps in North Korea. In each of these cases ILO is not fully content with the countries’ abilities to collaborate to investigate these claims, and therefore we decided to mark these countries as not having made slavery illegal yet, even if they have all signed UN conventions and banned it by their constitution. After gathering the earliest date of abolishment for all countries we could count how many had not yet abolished, each year between 1800 and 2018. 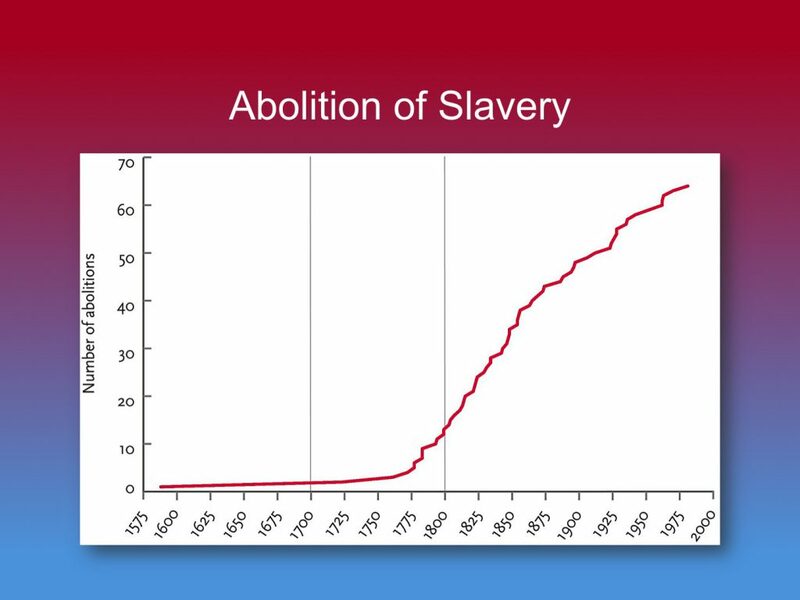 Pinker’s graph is based on records form a Wikipedia article called Timeline of abolition of slavery and serfdom, that he accessed in August 2009. It only shows the 64 abolishments that were listed at that time. As so many people fail to appreciate the fact that slavery has been banned almost universally, we thought maybe it is because nobody has compiled a complete dataset, so we decided to do that. This is our first version of a dataset with guesstimated dates for slavery abolishment for all 195 states recognised by the UN in 2018. The big trend looks the same, but we now have dates for all countries which we found in other sources, in addition to those on Wikipedia in December 2017 when we accessed it. As with all our data we try to apply the country borders of today, when we describe the history of the world, so that it’s easier to understand for a person familiar with the world today. In contrast to Pinker’s data, where an abolishment like the one in Madeira, Portugal in 1777 is counted, while that doesn’t represent the complete area of Portugal today, we wouldn’t count it. ) The work was conducted in just three days, by reading up on the other sources listed below, and the risk that we misinterpreted the law or constitution in several countries is quite large. The earliest record we have found of abolishment of slavery in a country where the borders coincided with the modern borders of the country today, took place in Lithuania in 1588, according to Wikipedia. The data is compiled by quickly reading legal records with clear statements banning legal slavery. In most cases we consider the year of the earliest recorded we could find, when a country either signed one of the UN treaties condemning slavery and/or forced labour of all citizens and guest workers, usually one of ILO from 1930 or ILO from 1957, but other countries signing the UN Slavery Convention in Geneva already in 1926. But already then, many countries already had laws or constitutions banning slavery. Then we prefer using the dates of such laws and constitutions if we could find them. In some countries a law was passed that banned holding the country’s own as slave, while foreigners continued being legal. Such cases are not counted as abolishment. And Many early abolishment’s were also restricted to banning slave trade, which is not really the same thing and those dates are also excluded. In France, for example, it’s hard to say when slavery was abolished, see Wikipedia. In 1315 Louis X abolishes slavery and every slave setting foot on French ground should be freed. This sounds sufficient, but then in 1794 Slavery is abolished in all French territories and possessions. And then in 1802 Napoleon re-introduces slavery in sugarcane-growing colonies. And then comes the date we have used in our data, in 1848 Slavery is abolished in all French colonies, which includes all the overseas areas that are considered France by the UN today, which is our definition. Reading all laws and constitutions is a very time consuming task. Fortunately this was already undertaken by Dr. Jean Allain and Dr. Marie Lynch at the School of Law, Queen’s University in Belfast, who extracted the snippets related to forced labor and made them freely available in their online database for Slavery in Domestic Legislation: SDL. We read through their country pages with domestic law and constitutions for all 193 UN-members and gathered the dates where believe legal slavery and forced labor was made illegal. In principle, in 2018, all countries have abolished slavery, but we have decided to exclude three countries even if their constitution and law make forced labor illegal and they have signed UN conventions. It would just be too hypocritical to classify them as officially condemn slavery, when there are strong evidence that the government itself is actively using forced labour. The three countries we classify as still having legal slavery are those where reports exist, but ILO’s investigators are not getting full insight. This includes Turkmenistan (see ILO) and Uzbekistan (see ILO), where journalists report about forced labour in the yearly cotton harvesting with obligatory participation without economic compensation, commanded by state owned companies as reported by Antislavery. North Korea’s constitution banes slavery in theory, but in practice ILO has little or no insight into the real practice of the government, and the escaping witnesses reports from labor camp give no reason to believe that the current government is following its own constitution. Therefor the final number of countries with legal slavery add up to: 3. ILO: Forced Labour Convention, 1930 (No. 29) (C.29). Accessed December 2, 2017 List of countries and dates of signing. ILO: Abolition of Forced Labour Convention, 1957 (No. 105) (C.105). Accessed December 2, 2017. List of countries and dates of signing. ILO: ILO Country baselines: Turkmenistan. Accessed December 2, 2017. ILO: ILO Country baselines: Uzbekistan. Accessed December 2, 2017. ILO: ILO Country baselines: North Korea. Accessed December 2, 2017. SDL: Slavery in Domestic Legislation Database, a database by Jean Allain and Dr. Marie Lynch at Queen’s University Belfast. Country pages accessed Accessed December 3-4, 2017. Pinker, Steven. “the Better Angels of Our Nature: the Decline of Violence in History and Its Causes.” London: Penguin, 2011. UN: Slavery Convention: signed at Geneva on 25 September 1926 and amended by the Protocol New York, 7 December 1953 (STATUS AS AT : 23-11-2017 05:00:21 ED). Accessed December 2, 2017.